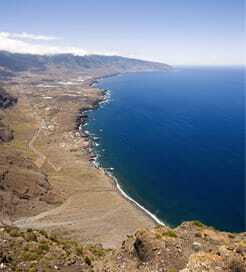 El Hierro is the smallest of the Canary Islands, lying south west of its more well-known neighbours. It has been nicknamed 'Meridian Island' and it is situated in the Atlantic Ocean off the coast of Africa. The delight of arriving at El Hierro by ferry is not to be missed. Ferry crossings operate most days sailing from Los Cristianos port on the neighbouring island of Tenerife to Valverde on El Hierro. Tenerife itself is well connected to the rest of the Canary Islands and mainland Spain as well as featuring two airports so should be used as a base for onward travel to El Hierro. The remoteness of the island has always been one of its most seductive attractions. As is the case with all the Canary Islands, El Hierro is volcanic and the terrain is dramatically mountainous with huge craggy cliffs against which the Atlantic waves crash fiercely. The island has recorded only one volcanic eruption, lasting a month, in the 1793; since then the juniper forests, evergreen woodlands, and pines have reclaimed much of the terrain, although in the south of the island there is clear evidence of the volcanic activity in the strange, unworldly rock formations to be found there.